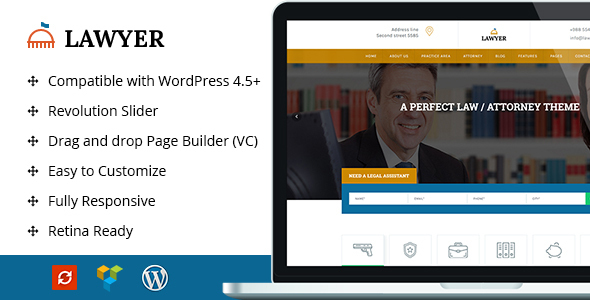 A Lawyer – Lawyer WordPress Theme is for Lawyers, private attorney,Advocates and all law related services website It includes all the functionality needed for legal services. Get your team profile displayed. Included Visual composer provides an easy editable section and content. A collection of great shortcodes allows you create attractive pages.Theme include two style attorneys pages,Theme include two style practice-area. It has Beautifuly and purpose oriented design with 3 home page variation. It have the contact form and the enquiry form included. This theme comes with necessary features for law firm website such as Attorney post type. The revolution slider makes the slider creation easiy and allow you to get various slider at your site.The theme is built for Barristers at Law, Legal Advisers, Lawyers, Attorneys,Legal offices, Advocates and other legal and law related services.